My tool outputs a line of analysis data for each nested string. In this sample, because of the obfuscation, there are a lot of them (22956, which is gigantic for an RTF file). Entry 165 is the one we will take a closer look at first. The information presented for entry 165 is the following: the nesting level is 4, it has 1 child (c=), starts at position 2ae5 in the file (p=), is 1194952 bytes long (l=), has 11429 hexadecimal digits (h=), has no \bin entries (b=), contains an embedded object (O), has 1 unknown character (u=) and is named \*\objdata133765. I highlighted the hexademical digits in red. From the magic header, we see that the embedded object is an OLE file (FYI: if we analyze it with oledump, we get parsing errors). 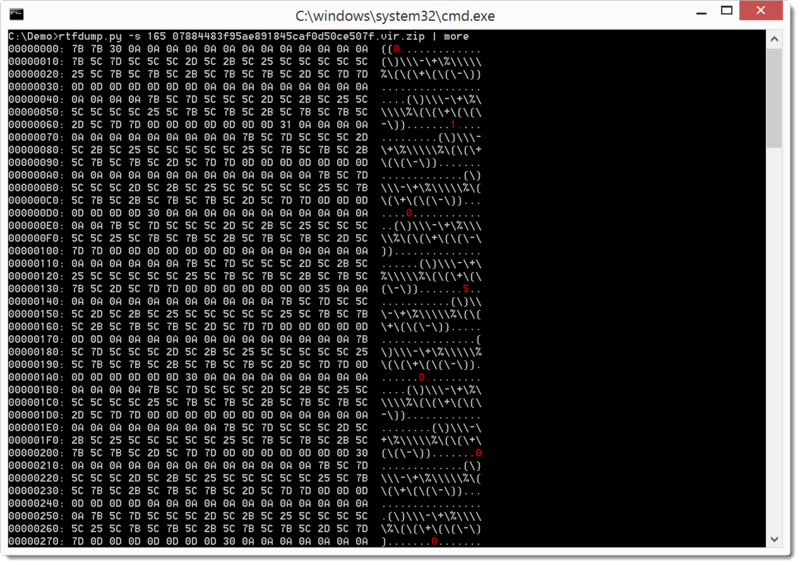 Taking a closer look, I don't only see a URL, but hex data that looks like shellcode. So this RTF file is a downloader. The first YARA search doesn't find anything. But the second search with option -H (to decode the hexadecimal content to binary) has hits for my RTF_ListView2_CLSID YARA rule. This indicates that entry 165 contains a byte sequence for the ListView2 classid, so this is very likely an exploit for vulnerability CVE-2012-0158 in this ListView. 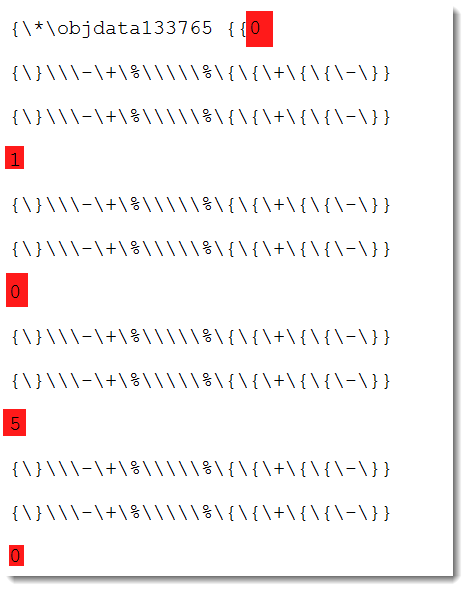 I also recently rewrote most of rtfobj to be able to parse the exact same samples. For this, I had to implement a full-blown RTF parser, that handles edge cases the same way as MS Word does (because the RTF specifications do not cover all the special situations exploited by these samples). Thanks a lot for your update and hard work Philippe. Great work , and great article. It looks like you need Python installed to run these. Do you program in Perl or do you just use Perl? Or you can use portable Python.